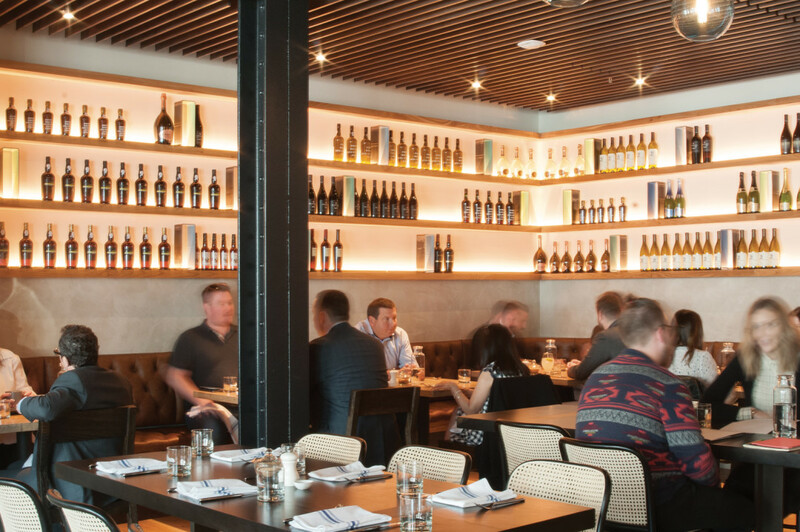 FROM THE MOMENT YOU WALK INTO THE PALLADIAN Hotel at the corner of Second and Virginia, the Seattle references fly. There are coded and not-so-coded music scene allusions, from the bar named Pennyroyal (recalling the Nirvana song “Pennyroyal Tea,” which might be about depression or might be about abortion, but if those are your choices it maybe doesn’t matter) to the lobby’s gilt-framed portraits of Seattle music notables—Jimi Hendrix, Dave Matthews—done up like eighteenth-century noblemen. Bill Gates and Frasier Crane get the treatment too. A gleaming bike stands ready for guests in the lobby. Boy, oh boy, are you in Seattle now! screams all this iconography, which Seattleites will find cheesy and ersatz. (Frasier Crane?) But walk a little further in, and spaces convey an aesthetic much more authentically Seattle. Off the lobby, the gothically underlit Pennyroyal, all plush tufted sofas and artisan cocktails and brick barback, simmers with boho elegance, making it just right for after a concert at the Moore Theater across the street. Keep going, around the corner and down the stairs, and you’ll find its companion restaurant, the visually glorious Shaker and Spear. Honestly, in a year of stunning restaurant design—Good Bar, Stateside, Lark—Shaker and Spear may trump them all on unlikeliness alone: a hotel restaurant that conveys a genuine sense of the local and the intimate. Woods warm and cool and smooth and rough conspire with steely sharp edges and glassy tall windows and exposed brick and a vibrant open kitchen to create surroundings as texturally satisfying as a rain forest. The room is on the small side, which may be why middle-of-the-room tables feel private. It’s as cozy by abundant daylight as it is after dark. There’s nothing touristy about it. A girl could get engaged in here. A seafood menu boldly deepens this sense of being somewhere. 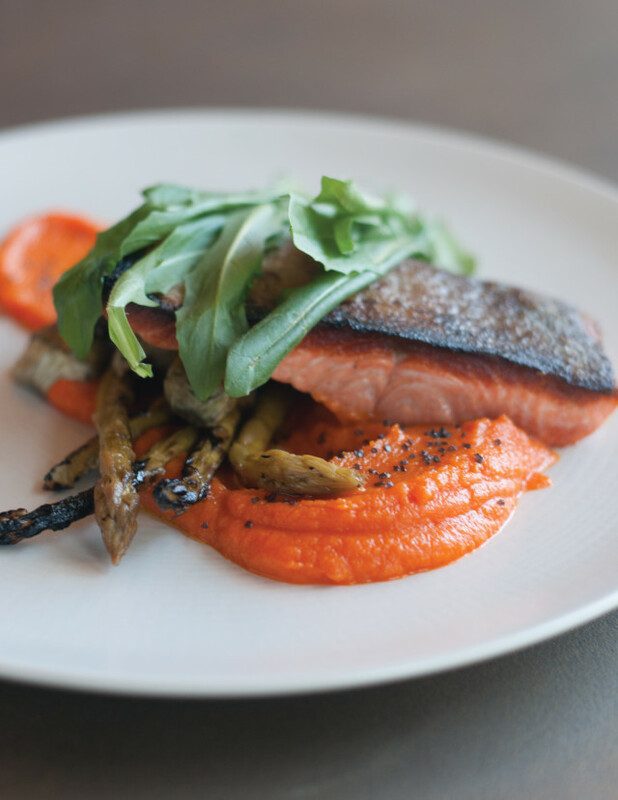 For decades I’ve watched in frustration as independent restaurateurs underplay Seattle’s waterside bounty, so it’s been almost touching in the last couple years to see new arrivals proudly building whole menus around seafood. Executive chef Walter Pisano says he’s dreamed of a fish house for years, locked as he’s been in an Italian program at Tulio, his restaurant at Kimpton’s Hotel Vintage further downtown. And so genuine excitement showed up on dishes like the grilled octopus starter, where thick-muscled, deeply purpled tentacles lolled in a bright salsa verde, with salted chickpea puree lending a bass note. Almost as good was a row of seared sea scallops, diver caught, attended by spinach, sweetened pine nuts, and dollops of golden raisin puree. Both were slightly overcooked, neither killingly so. A plate of true cod in a nicely acidic escabeche preparation was lavished with a confetti of diced peppers and squash, its crunching crust a smart counterpoint to the vegetables and the flaky flesh of the fish. All offered plenty of flavor. “Local seafood—in a destination downtown!” I chirped into my notebook, thrilled to find a singular alternative to the touristy Etta’s or the canned Anthony’s or the mediocre Blueacre. Then I looked closer at the menu. More than half of the cocktails were built on sherry, the “It” spirit right now, showing that someone’s sensibility here is hewing more to the dictates of fashion than vision. Well all right, that’s cocktails. But on my first encounter with the dinner menu, four of the six seafood entrees were imports—including tombo and opah, often seen on tropical menus. I chose the whole branzino—Pisano offers a whole-fish preparation every night—and it was fluffy and light, swathed in crispy skin, its plate drizzled with chimichurri, and beautifully paired with firm orca beans and petite red beans, which disintegrated almost to cream on the palate. Still, branzino is about as Northwest as rhino meat: not a criticism of Shaker and Spear so much as it is a clarification that this place, which seems so much like a regional restaurant, eats more generic than that. What is a criticism are the conceptual missteps, most of which take the form of a dispiriting dearth of verve. A hunk of smoked black cod with a dice of pickled rhubarb—so promising!—tasted only marginally smoky and barely pickled at all. Pisano is going for simplicity in his preparations—the noblest goal when it comes to seafood—but simplicity shouldn’t be confused with blandness. A panfried hunk of yellowtail, translucently sashimi-like within, either redefined subtlety on its puddle of cream with English peas and wild mushrooms—or lacked the courage of its flavor convictions. I’m afraid it was the latter. Even the bread wanted flavor. In my experience, Tulio trends lowest common denominator in a similar way, pulling punches by sacrificing innovation to please the masses. Service reflects the same obsequious superficiality, from waiters who are unfailingly smiling and charming and avid, but don’t know which fish—on a fish house menu—are local and confidently declare that XO sauce is African (it’s Asian). Where generic food and surface-level hospitality collide—besides inside hotel restaurants—is in the disheartening conclusion that a restaurant is willing to be whatever guests want it to be. Only here’s the pity: We want it to be reflective of an authentic soul. The glorious room is there. Here’s hoping the menu and service catch up.